A treasure to remember for a lifetime and then some, the 7-8mm White Freshwater Pearl Set show its magnificent beauty with its light and sparkling beauty. 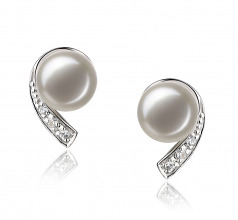 The white pearls are set in the .925 Sterling Silver bases lets one appreciate the sparkling and magical feeling that erupts each time the sun’s light hits it in just the right way. 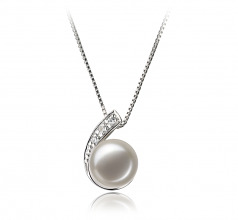 The white freshwater pearl features an (AAA) button shape and similarly amazing luster. The near perfect button shape works in seamless harmony with its surface luster. The (AAA) luster shows its amazing shine and brilliant sparkling appeal. 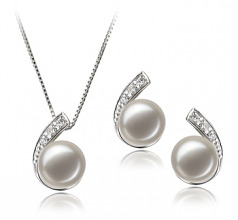 The brilliant look radiates off its zirconia neighbors to create intriguing rays that race along the gleaming sterling silver for the ultimate in a show stopping set of white Freshwater Pearl Earrings and necklace. Combined with an elegant hairstyle, your next casual, business or formal outing will be a dress to impress event. Show only for "Claudia Set"